Straight from the workshops of famed Steampunk inventor Ezekiel Rosenstein, this Automatons Eye Ring is an ocular wonder - a Steam-powered robotic eye, complete with a working lid, mounted on a band and worn like a ring! This startling Steampunk ring is composed of 3-toned pewter, featuring colors reminiscent of iron, gold, and copper. The ring features a round half-sphere mounted on a flat base, as well as a small gold-colored gear on one side and a matching lever attached to the other side. When closed, the eyelid features runic copper designs emblazoned across the eyelid. When opened, however, the ring reveals shockingly realistic-looking humanoid blue eye that stares out at the world with a placid look. 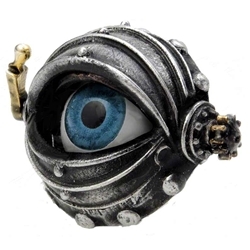 You may not ever have eyes in the back of your head, but now, with this Automatons Eye Ring, you can have eyes on as many of your fingers as you wish! You can even open and close them at will, ensuring that you can keep your eyes on whoever you wish, whenever you chose to!